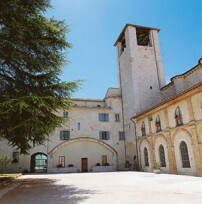 The entire convent of St. Agostino was constructed in the second half of the XIII century on a land given by the municipality of Gubbio. The church, having one olny nave with cross-sectional arches supporting the roof, is in the style derived from the cistercense architecture. The facade was completely reconstructed in XVIII the century. At the inside some noteworthy frescoes of the Nelli can be found: the "History of S.Agostino " and the " Universale Judgment" painted by the artist with simplicity and coherence.